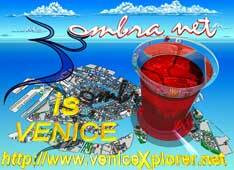 The downloadable map of Venice " venice eXplorer " is at the heart of venice eXplorer.net. It is a unique product, soon to be available for PDA�s and cellular telephones. The downloadable map of Venice offers a useful store of knowledge on the town of Venice. After the free registering with, the site users can receive monthly reminders to download updated information, making it similar to a magazine. Next to the basic version, in order to complete and update the range of sections, a few �light� add-ons, such as the calendars of events and shows in Venice will be produced, for a total weigth of 5 Mb. Other information on the city of Venice, such as its works of art, authors, photographs, layout maps and more, is also available. This map of Venice, Giudecca, Lido, Murano, Burano e Torcello has been produced with the aid of Macromedia Flash MX and it is compatible with Macromedia Flash Player 5 and its later versions. Macromedia Flash Player is pre-installed on most computer, since it is enclosed in Windows� 98, Windows XP, Netscape Navigator�, America Online� suites and Macintosh operating systems; statistics show that 97.8% of browsers use it, 474 million people. As with venice eXplorer. net, the downloadable map is available in eight different languages, including Mandarin and Japanese.